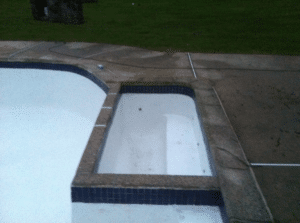 Swimming Pool Stain Removal Specialists | Coronado's Pool Renovations, Inc.
Chemical stains can be some of the most unsightly things you’ll ever see in your pool. Iron, copper, trapped moisture, and even the wrong type of water can all contribute to a nasty-looking tint that nobody wants to get close to… and regularly scrubbing your pool won’t get rid of these deposits! Here at Coronado’s, we’ve been working on removing chemical stains in pools for over 25 years, and we’re fully certified in cleaning techniques that won’t damage the environment or make it unsafe to swim after we’re gone. 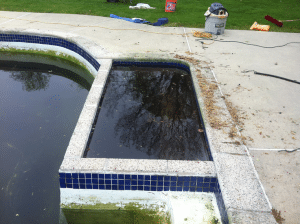 Instead, we’ll do everything we can to get rid of the stains and help your pool shine the way it used to. How Long Does It Take To Remove A Stain? That depends on the type and severity of the stain. Light deposits won’t usually take long to remove, but pools that haven’t had their stains removed in a long time may need extra care. Stains can also come back quickly if their source isn’t stopped – if we’re helping you with that, it may take 48 hours or more to circulate your pool water and check the various possibilities. This is a case-by-case thing, however – most stain removals won’t take nearly that long. It’s Only For Chemical Stains? Chemical stains are very different from the residue left behind by organic material (such as leaves), and they need to be treated in a different way. Our cleaning process was specifically designed to deal with chemical buildup and clean your pool as safely and quickly as possible. How Important Is It To Clean Chemical Stains? It’s very important to monitor the level of chemicals in your pool and ensure that it gets cleaned on a regular basis – and that you’re able to put a stop to whatever is feeding the chemicals to your pool. Left untreated, this buildup of chemicals might eventually lead to serious medical complications. Don’t take chances with chemical stains – the professionals at Coronado’s can clean out your pool and make absolutely sure that it’s safe for you to enjoy again. Contact us today for an inspection and a quote for the job – our certified, professional teams are ready to help as soon as you need us.